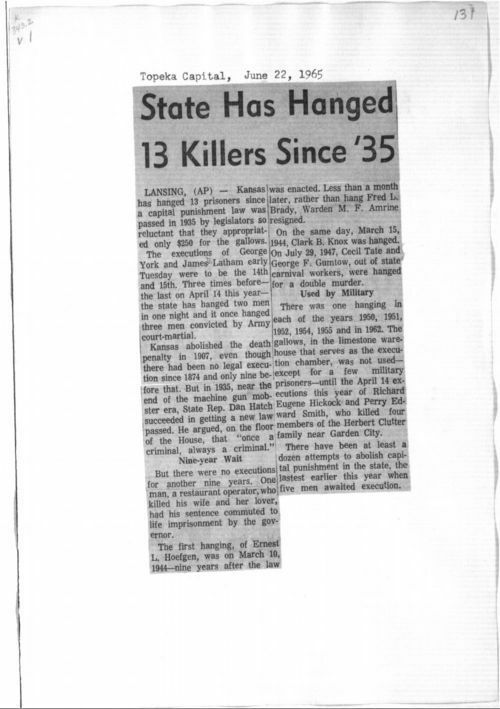 This newspaper article on the history of the death penalty in Kansas appeared in the Topeka Capital on the day George York and James Latham were executed at the Kansas State Penitentiary at Lansing. York and Latham were sentenced to death for the killing of Otto Ziegler in Wallace, Kansas, though they had murdered at least six other people on route between Florida and Colorado. The article summarizes the many changes in Kansas capital punishment law. The article claims the "mobster era" of the 1930s was the primary motivation behind the legislature's reinstatement of the death penalty in 1935, after its initial repeal in 1907.